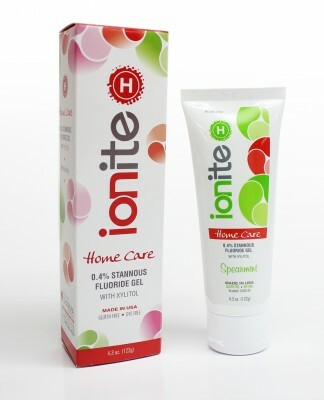 • Ionite-H Home Care is a brush-on gel that contains 0.4% stannous fluoride. • It reduces sensitivity and plaque biofilm while inhibiting the cariogenic microbial process. Prevents demineralization and promotes re-mineralization. • It is a clear thixotropic gel that can be applied with a toothbrush or a fluoride tray. Stannous fluoride is non-water soluble so there are no food or drink restrictions after application. • Specially formulated flavors to prevent bitter aftertaste and to give patients a pleasant taste. • It is alcohol-free and dye-free. • Contains Xylitol, the ideal ingredient for caries prevention. This ingredient is specific in its inhibition of the mutans streptococci group, bacteria that are significant contributors to tooth decay. Safe for diabetics and individuals with hyperglycemia.